David Vanderbilt (Rutgers University, New Jersey). Cambridge : Cambridge University Press, ©2018. x, 384 págs. : ilustraciones ; 25 cm. Resumen: Over the past twenty-five years, mathematical concepts associated with geometric phases have come to occupy a central place in our modern understanding of the physics of electrons in solids. These 'Berry phases' describe the global phase acquired by a quantum state as the Hamiltonian is changed. 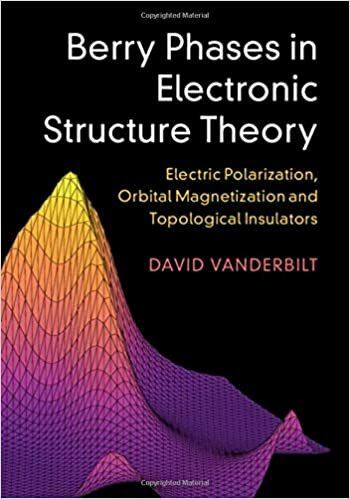 Beginning at an elementary level, this book provides a pedagogical introduction to the important role of Berry phases and curvatures, and outlines their great influence upon many key properties of electrons in solids, including electric polarization, anomalous Hall conductivity, and the nature of the topological insulating state. It focuses on drawing connections between physical concepts and provides a solid framework for their integration, enabling researchers and students to explore and develop links to related fields. Computational examples and exercises throughout provide an added dimension to the book, giving readers the opportunity to explore the central concepts in a practical and engaging way. Orbital magnetization and axion magnetoelectric coupling.